Texas Bluebonnet Award nominee Spy Camp by Stuart Gibbs has all the makings of a great Disney Channel sitcom: lots of too-clever kids, a bumbling dad, danger and peril that miraculously never ends in anyone getting killed, and boy-girl chemistry and crushes with no actual romance happening. There’s no literary ground being broken here, and in fact the book is a sequel to Spy School featuring the same characters. Bur readers definitely don’t need to read the first book to check in to Spy Camp, since the book’s story can stand alone. The book’s hero, Ben Ripley, is a middle schooler. His parents think he’s attending a science and technology magnet school, but of course, he’s really at a top-secret training facility for future spies. Spy Camp begins with Ben reluctantly packing up for a spy summer camp, but it’s not going to be all s’mores and songs around the campfire. Before he can even unroll his sleeping bag, Ben gets a letter with a no-win proposition. In the first book, Ben foiled a plot by an enemy spy organization called SPYDER. Now, they’re so impressed with Ben that they have given him two choices — join the enemy agency or die in 24 hours. 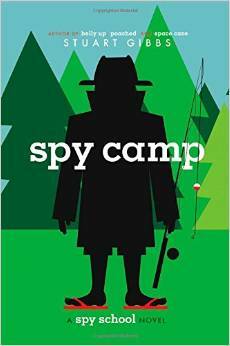 Spy Camp is a quick, fun, read with enough action to keep middle-elementary readers engaged. Not surprising, since author Stuart Gibbs is a real-life adventurer who’s climbed Mt. Kilamanjaro, ice-climbed in Patagonia, and faced down a charging elephant. A third book in the Spy School series is already scheduled for publication. As with the other nominees, the Texas Bluebonnet Awards folks have put together some amazing resources for Spy Camp readers.